Description: Are these locos old enough to smoke? Description: BNSF 7912 descending Cajon Pass near Cajon Jct, California in 2011. 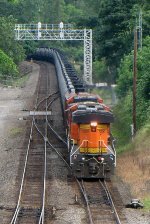 Description: A northbound BNSF freight being led by a modern GE diesel crosses an older wooden bridge on the way out of town. Description: Diane shot past me to get this eastbound out the window of the RV. Description: The eastbound wed been pacing now crosses over us. It will meet a westbound here very shortly. Description: Three BNSF diesels lead a mixed freight north through Norman. Description: Ex-BN still in service! Description: In the days last light BNSF 7250 Rumbles west with a stack in tow on the Chillicothe Sub.